Bursting with Bountiful Harvest Color and Flavor! 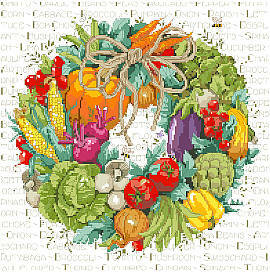 Delicious vegetables accentuated with a rope bow over a background of bees and the names of fruits and vegetables. It is a spectacular harvest-time wreath filled with the good foods that enrich our health and lives.